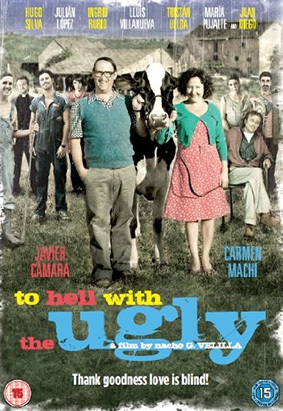 Matchbox Films have announced the November UK DVD release of two Spanish films from 2010, Di Di Hollywood, the final film from Jamón, Jamón and Golden Balls director Bigas Luna, and To Hell with the Ugly [Que se mueran los feos], from Chef's Special director Nacho G. Velilla. Diana Diaz (Elsa Pataky) has always dreamt of being a star - and she'll do anything to make it. In Hollywood, she tries desperately to land any part she can. Used and abused by agents and producers alike, Diana soon discovers how hard you have to climb to reach the heights of success in a world of lies, luxury and fame, where nothing is quite what it seems. Be careful what you wish for – you might just get it. The film also stars Peter Coyote, Paul Sculfor and Giovanna Zacarías. Di Di Hollywood will be released on UK DVD on 11th November 2013 by Matchbox Films at the RRP of £15.99. No extra features have been listed. Eliseo (Javier Cámara – I'm So Excited!) is ugly, lame and single. He still hasn't found the woman of his dreams and he doesn't really know what love is. Nati (Carmen Machi) is similarly ugly, she's missing one breast and is currently separated. She's just met the man of her dreams but she doesn't know what real love is either. Eliseo, on the other hand, fears that the worst is just around the corner, whilst Nati fantasises that the best is yet to come. When Eliseo's mother dies, their two paths cross for the first time in twenty years, giving them one last chance to find happiness and love. But what happens when your ideal woman is married to your brother? To Hell with the Ugly will be released on UK DVD on 11th November 2013 by Matchbox Films of £15.99. Once again, no extras have been listed.